Fig. 2. Total number of archaeological excavations during 2007–2009 in Bulgaria according to the type of site. Fig. 3. Distribution of archaeological sites during 2007–2009 in Bulgaria according to duration of their excavation. Fig. 4. Lower Paleolithic (middle levels) lithic industry from Kozarnika: a, core transformed into side scraper; b, d, f, borers; c, e, cores (drawing by S. Taneva, S. Sirakova, and I. Dimitrova). Fig. 5. 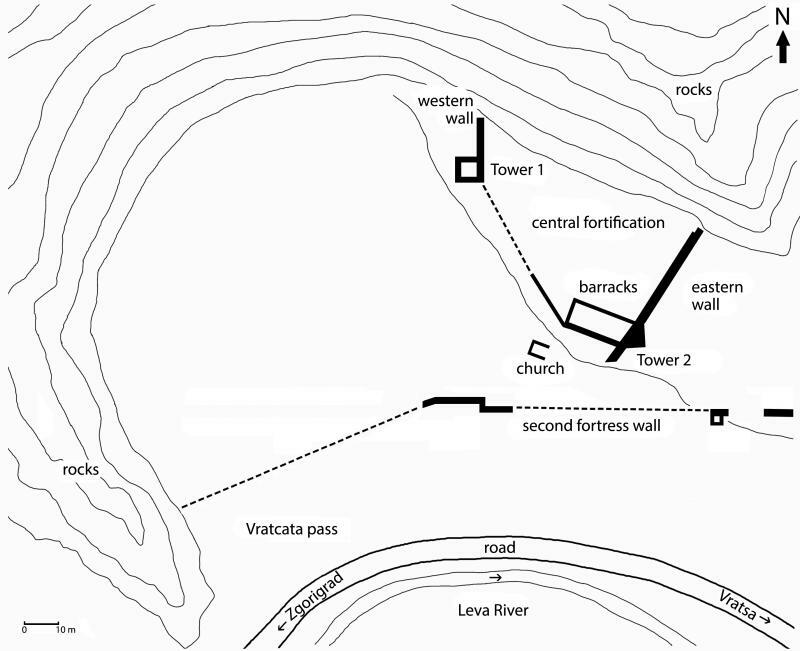 Plan of the fortress in Vratcata locality (drawing by N. Torbov). Fig. 6. Eros figurine from the decoration of a cart from Karanovo (V. Ignatov). Fig. 7. A hoard of flint tools and jewelry made from spondylus shell found at Tell Kosharna (D. Chernakov). Fig. 8. A treasure of gold Byzantine solidi from Castra Rubra (B. Borisov). Fig. 9. Section of a profile in the Late Chalcolithic (Varna period) pit feature used for salt extraction that was found within the production complex by the tell at Tell Provadia-Solnitsata (V. Nikolov). Fig. 10. Red-figure lekythos, fifth century B.C.E., from the necropolis of Mesambria (P. Kiashkina). Fig. 11. Statue of Cybele from Balchik (R. Kostadinova).